This year I'm expanding my fruit garden. I already have two dwarf apple trees and a dwarf pear tree. I bought these last year and I'm hoping they will fruit this year. I'm also going to get. 36 strawberry fruits. These are Marshmello, they have the best taste but they don't travel well so the supermarkets weren't interested in them. I want to make jams and preserves out of the fruit, at least then I know exactly whats in them. Got an email from Spalding Bulbs, they are offering a free cherry tree if you spend over £10. I ordered a Honeyberry, it tastes a bit like a blueberry but has an aftertaste of honey. This means that my planned fruit garden has changed again. I'm having 3 planters and these will have a blueberry (top hat), the honeyberry (need to get another one) and the cherry tree. A lot cheaper. P&P is under a fiver as well. 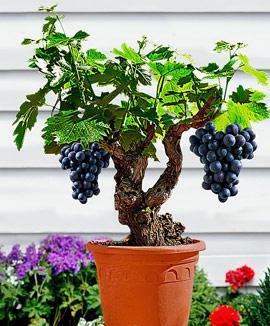 Spaldings also have a patio grape vine that I'm really keen to get. Heres some pictures of my fruit. The rhubarb is just starting to poke through the soil. The honeyberry looks as if doing okay and even the cherry tree is starting to bud. So is the blackcurrant, at least I think its a blackcurrant. Heres some updated pictures of my fruit. I still have to order my strawberrys (50 of them) and another 4 honeyberry plants. They are from left to right: 2 x apple trees (one red and one green), blackcurrants (I think), blueberrys, cherry, honeyberry, rhubarb and a pear tree. I won't get any blueberrys, cherries or honeyberrys this year but hopefully will get some apples, pears, strawberrys, and blackcurrants. The rhubarb is already doing okay.